American lawyers are fond of calling the highest court in their land SCOTUS -- hence the name of the blog dedicated to covering the work of the Supreme Court of the United States. Perhaps soon, then, we'll hear our colleagues across the pond utter the acronym SCOTUK. That's the thought that jumped to mind while watching, on C-SPAN, last week's 1st-ever hearing of the Supreme Court of the United Kingdom. It's a 12-Justice court now staffed by 1 woman -- Lady Brenda Marjorie Hale (left), aka The Right Honorable the Baroness Hale of Richmond-- and 10 men. One seat is vacant. 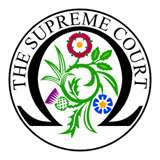 These Justices will serve as the final domestic forum for litigants in England, Scotland, Wales, and Northern Ireland, hearing cases that may last for days, quite different from the 1-hour arguments typical in the United States. In a twist, the lawyers wear robes, and wigs, but the Justices prefer plainclothes. The court's 1st argument entailed a fascinating interplay of internal and international law. 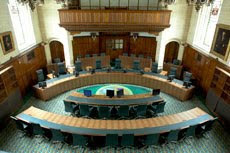 ► Did Parliament give sufficient authorization when it enacted the rather brief United Nations Act 1946, which permits orders "necessary or expedient for enabling" Security Council "measures to be effectively applied," or, to the contrary, did the asset seizure overstep the executive's power under Britain's constitutional structure? Just as the court's name bears echo with its U.S. counterpart, the issue recalls one recently before the latter court; that is, whether Congress' Authorization to Use Military Force justifies indefinite detention post-9/11. The similarity vel non of the answers remains to be seen.